I’ve got a four-day job repapering a large master bathroom in the West University neighborhood this week. Twenty two rolls is a lot of paper to remove, but I worked happily today – because THE PREVIOUS INSTALLER USED A PRIMER! Most paperhangers who work in new construction skip the primer. Wallpaper hung directly on the Sheetrock can be murder, if not impossible, to get off, and frequently causes much damage to the Sheetrock. A layer of primer costs little and does so much to protect the drywall, make installation easier, ensure adhesion, and facilitate removal later. “Easy” isn’t the same as “fast,” though. There are still several steps to go through, plus waiting for paper to soak. In the photo, you see the original paper on the left. In the middle, you see the white area, where the top printed layer has been pulled off, leaving the white backing. This backing requires soaking. I use plain hot water, no chemicals. Once it’s wet enough to reactivate the paste underneath, this backing layer can be peeled off or scraped off. On the left of the photograph, you see the wall, with it’s coat of white primer and a little of the tan clay paste used by the first installer. Once all the paper is off and the surface has dried, I will prime the walls. Once that’s dry, all that’s left is to hang the paper! 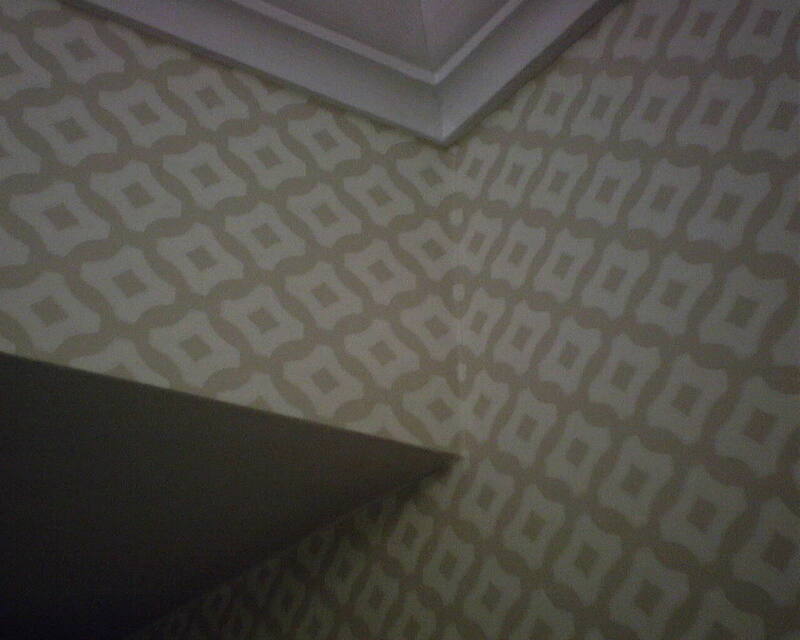 When wallpapering a room, the last corner will always end in a mis-match. In this case, the pattern doesn’t match, but you can hardly notice it, because the pattern elements line up and come together so well. 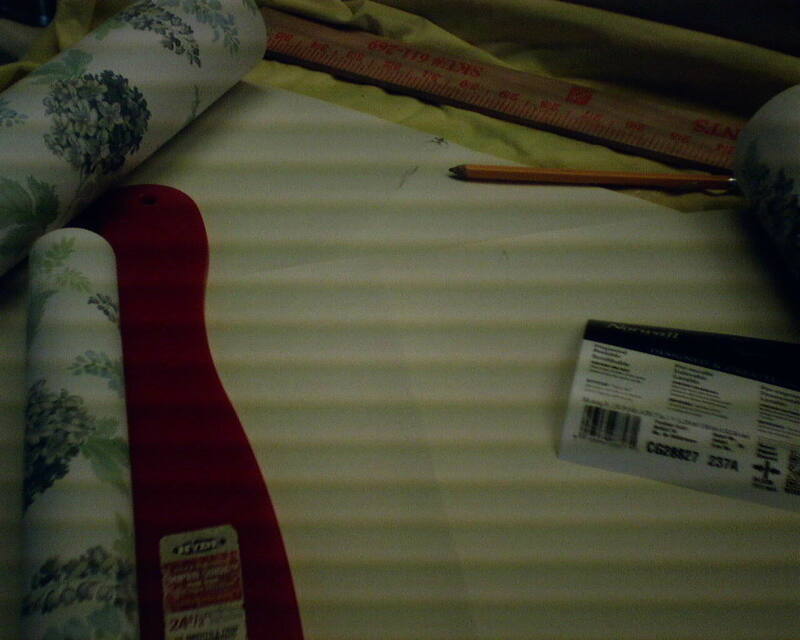 The wallpaper pattern is Thibaut 839-T-1838. 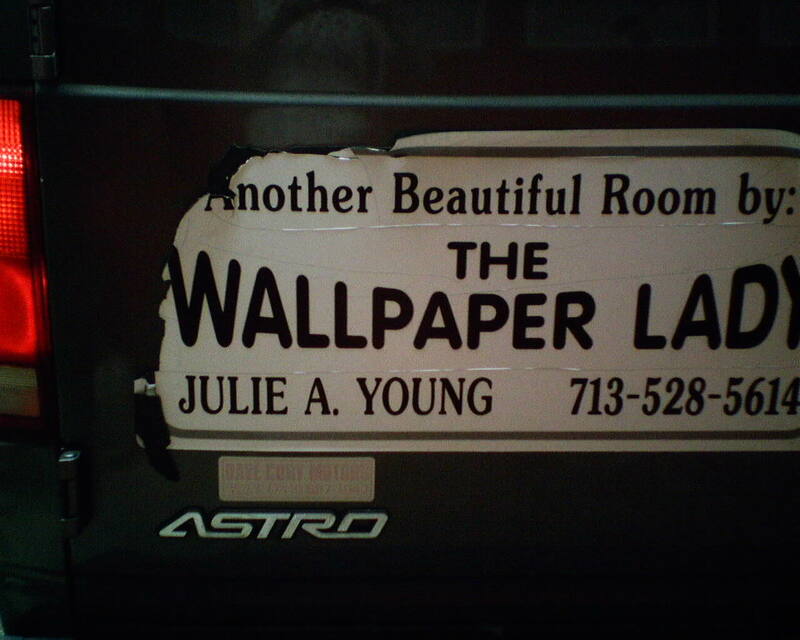 I hung wallpaper on one wall of this room (called an “accent wall”). Typical to Houston, the home had texture on the walls. Texture looks horrible under wallpaper, so I “skim float” the walls first, to smooth them. This involves troweling on joint compound (kinda like plaster), letting it dry, and then sanding it smooth. Even when using “dustless” joint compound, there is dust. Believe me – there is dust! 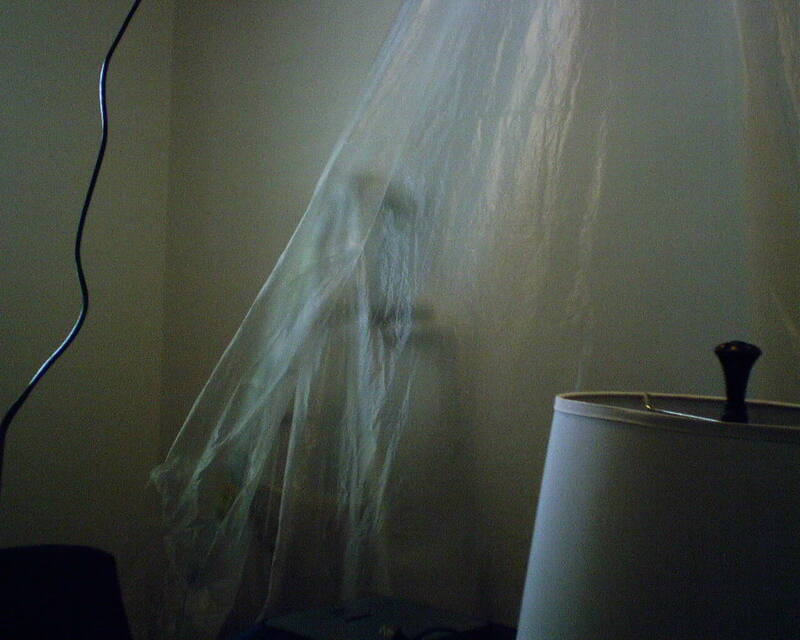 So I use plastic sheeting to create a “tent,” to contain the dust to just a few feet along the wall where I’m working. I tack it to the ceiling, do my sanding, and when all the dust is vacuumed up and the walls are wiped with a damp sponge, the plastic comes down. Voilà! The rest of the room is nice and clean and dust-free. These days, there are a good many places to buy wallpaper. Sherwin-Williams stores being one good source, and, my favorite, the Southwestern Paint on Bissonnet just west of Kirby, where Dorota Hartwig is a master at finding just the paper you want, at very low prices, as well as helping with paint colors. One of my clients read about Dorota on my blog, and followed my advice to make an appointment and visit her. The problem was, a whole lot of other shoppers swarmed to the store at the same time, and everyone wanted to look at the same wallpaper sample books. That deluge of wallpaper-hunters meant that poor Dorota could not give any one of them her full attention, some of the books they might have wanted to look at were checked out, and the shoppers didn’t get the full benefit of Dorota’s skills and talent at helping them. This is why I encourage people to make appointments. And then hope that all the OTHER people make appointments, too. Don’t Get Paste on the Grasscloth! 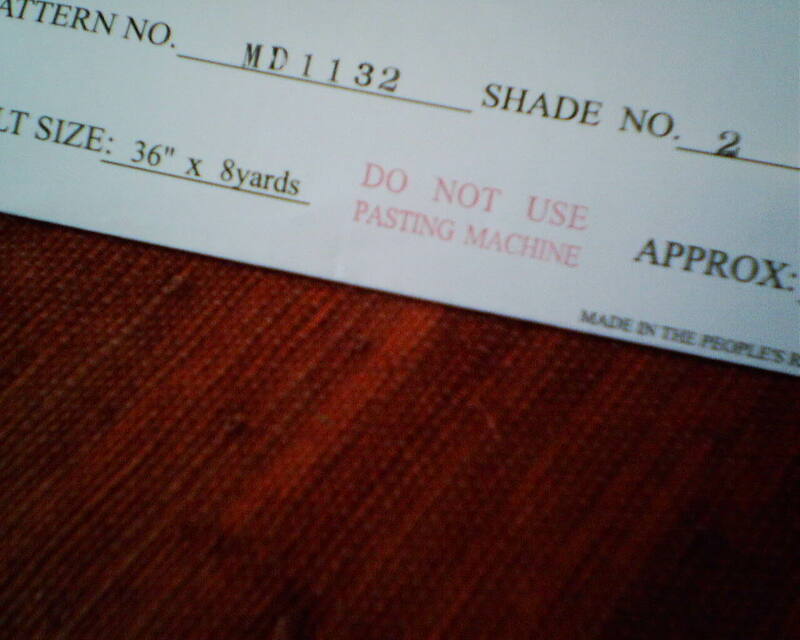 There’s a reason why the manufacturer doesn’t want the paperhanger to use a pasting machine. It’s much more likely that some paste might get on the surface, and that would cause staining or bleeding. I always apply paste with a brush, and when pasting grasscloth, I take care to not let ANY paste get beyond the edge of the paper. I also keep my hands clean and dry and paste-free. 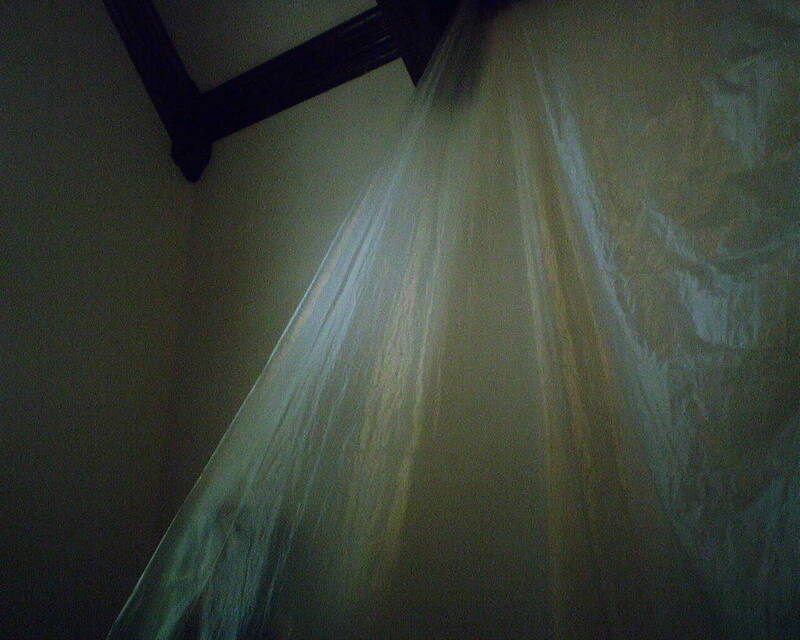 Sorry for the “venetian blind shading” on this photo… my camera was acting wonky. What you are looking at is a lot of dirt on the back of one roll of paper (there was much more, in addition to these two spots), and, on the other roll, you see a crease that spans the full width of the roll. 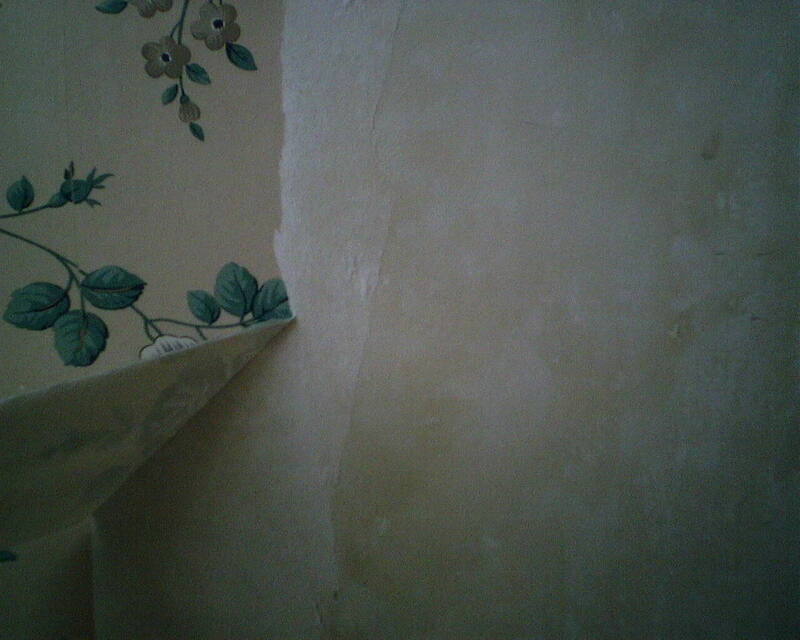 There were many such creases in this particular double roll of wallpaper. Sometimes, they dry out nice and flat. But you can never count on that, so I put that roll aside and used it only for small strips or areas that would not be seen easily. This pattern is by Norwall. A client called me today and said she lives in Katy and was having a Devil of a time finding someone to hang wallpaper for her. 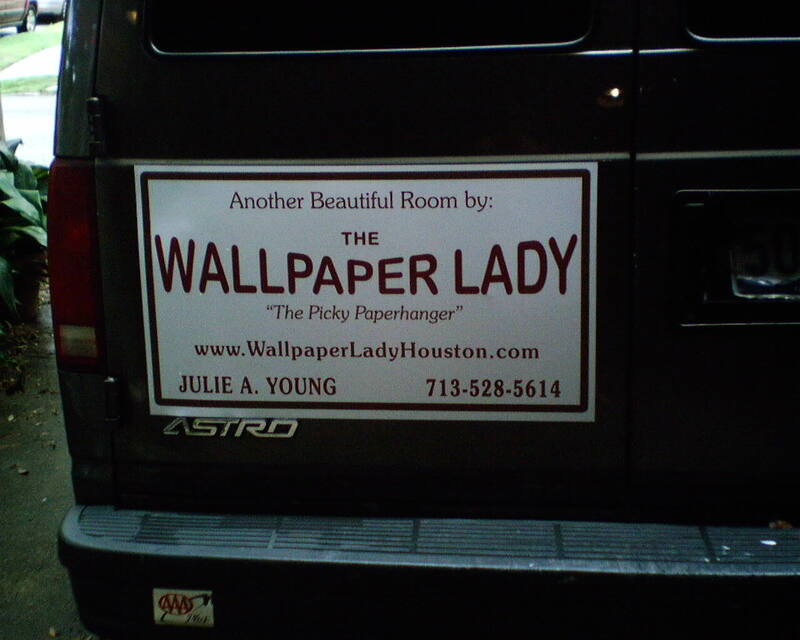 She said she couldn’t find a local paperhanger, and then she had contacted a number of painters, and even interior designers, and everyone told her that they either didn’t install wallpaper, or were taking it down – not putting it up. Well, all those painters and decorators must be behind the times, because wallpaper is very much in style – it’s all over HGTV and in all the “shelter” magazines. Hey, Katy residents! 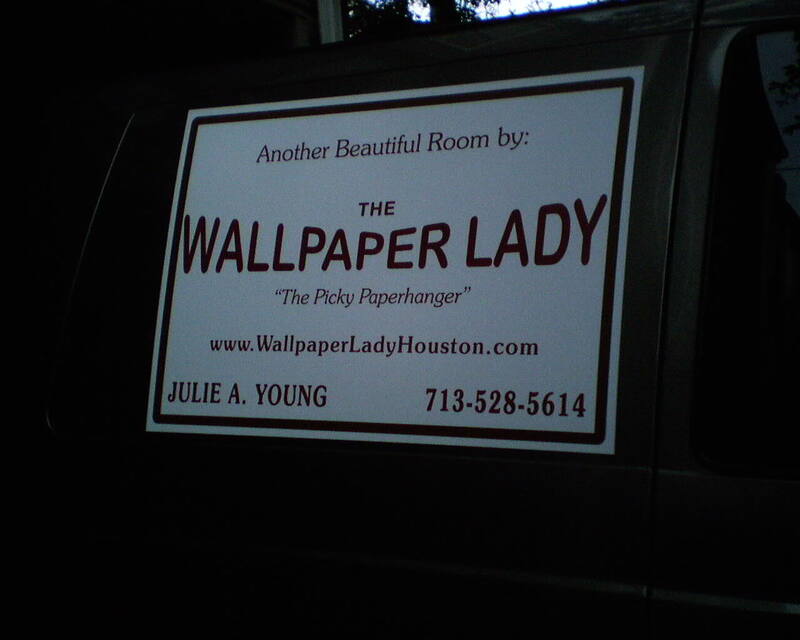 I am here, I hang wallpaper, and I work in Katy! If you’re looking to pump up the decorating volume in your home with a little pattern and color, please call or e-mail me! Think It’s Time for New Truck Signs?! Having your name and what you do displayed on your vehicle is a very valuable marketing tool. 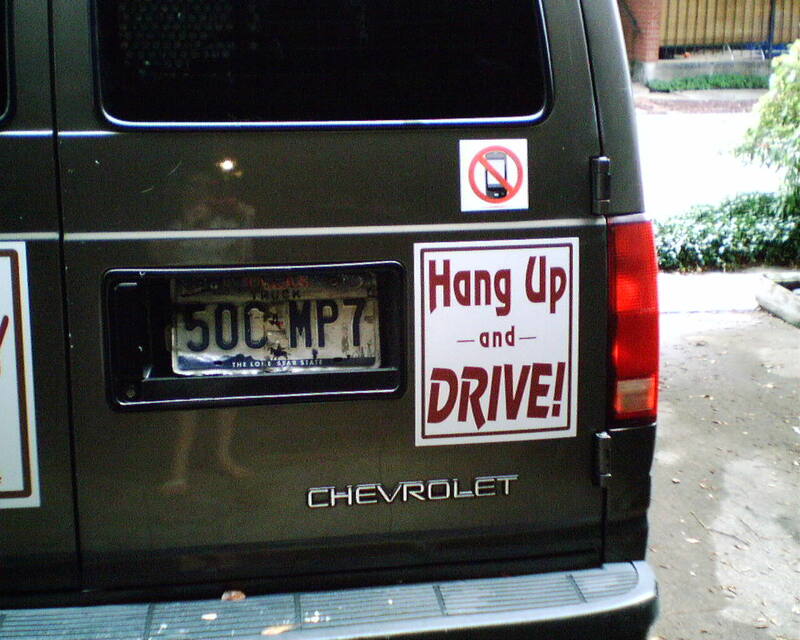 I get calls all the time from people who have seen my van around town. 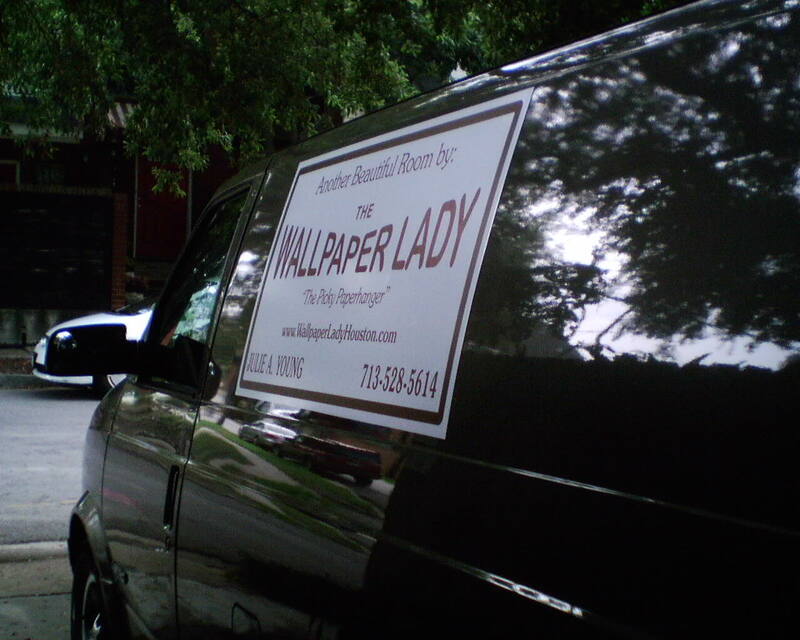 And, if someone sees you parked in front of his neighbor’s house all day, they figure the neighbor has done research to hire a good wallpaper hanger, and so they’re likely to call me, too. The old signs were about 10 years old, so I think they served me well. They only started curling and crumbling six months ago or so, so they didn’t look quite this bad for very long. I got the original ones at Fast Signs. I went there again to get the new ones, but they had a screwy rule that I had to sign a commitment to buy the signs BEFORE they would show me what they would look like. Phooey on that! I wish I had asked her to make the lettering a little fatter, to be more easily readable from a distance. But all in all, I think they look great. These new signs were made by Andrea Fischer, of the Ink Link, in Brenham, Texas. 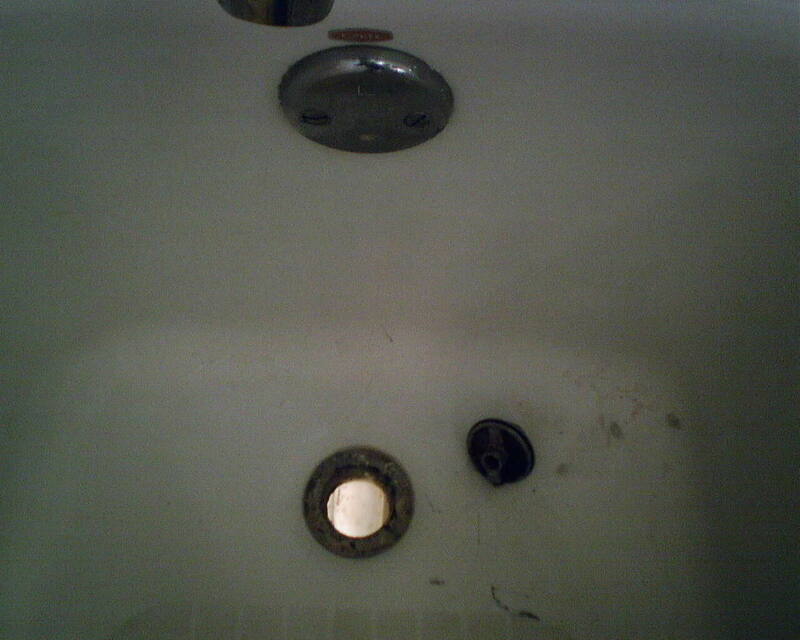 You are looking from above at the drain in the bottom of a bathtub. This 1910 bungalow in the Heights is set on piers 18″ or so off the ground. What you see is sun light reaching under the house and illuminating the white PVC drain pipe. This was in a hall bathroom where I hung a trellis patterned wallpaper. 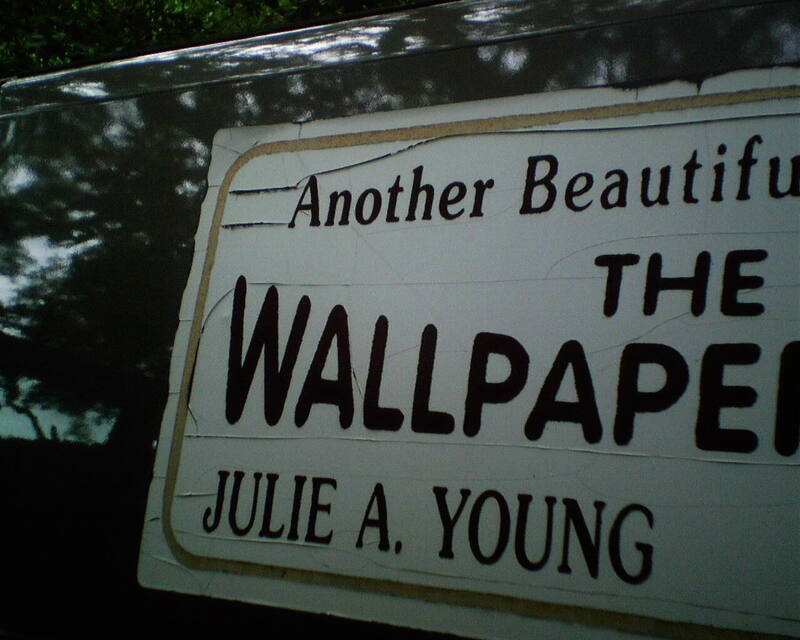 You are currently browsing the Wallpaperlady's Blog blog archives for July, 2013.